Political beliefs aside: what the heck has happened to the Romney/Ryan campaign in the last 30-ish hours? Before the Presidential debate, photos of Vice President nominee Paul Ryan hit the web. No, not the ridiculous gym photos that were released. Photos of Paul Ryan in a soup kitchen washing dishes. However, most of us saw the photos attached to articles exposing a debacle. Were the dishes actually dirty? Were there even patrons in the soup kitchen? Did he even get permission to have cameras there? The event has been called a photo-op, not an actual act of volunteerism. Of which has been eaten up by media and Romney opposition. However, with the debate happening, the GOP had the hope of everyone forgetting about the soup kitchen. Mitt, or “Mittens” as he has been dubbed by the Social Media Public, had such a strong showing in the first debate against Obama (who apparently had taken too much Xanex the first time through) that his lack of facts did not seem to affect the final win. So, he had an opportunity to make it aaaaallll better for Camp Romney by doing it again. Lies or not. However, Mitt has a habit of talking… And that gets him in trouble. 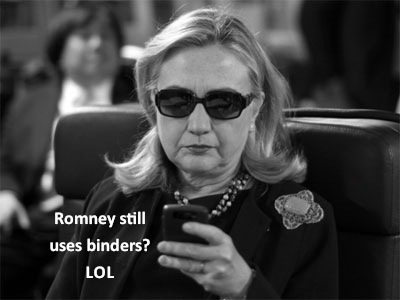 Now, there has been a social media storm about “Binders Full of Women” including a Twitter, Facebook and Tumblr page. So… now how will the Republicans respond?